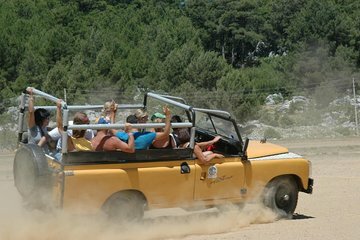 Venture off-road into the Taurus Mountains on a full-day jeep safari, including lunch and hotel transfers. Experience village life as you stop at mountain villages and visit a traditional Turkish teahouse along the way, then enjoy a prime view of the dramatic Manavgat Waterfall. As always jeep safaris are a fun way to see some of the local environment and top up your tan. Nice lunch and well paced. Perhaps better if less time was spent at the restaurant and more time at Manavgat waterfall as this was slightly rushed.